Discussion in 'Overclocking & Cooling' started by jfreund, Jul 26, 2018. 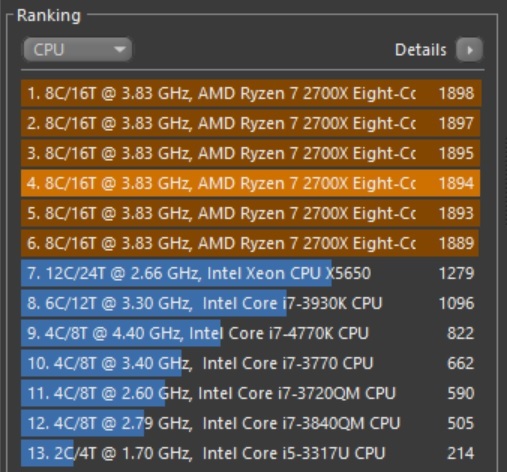 I've set my FSB to 103.3 to get the 2700X to boost up to 4490 MHz and get my 3200 CAS 14 DDR4 to 3300 MHz. The RAM got a bump to 1.4V, but the CPU voltage is left on Auto. The board is an X470 Aorus Ultra Gaming and the RAM is Team Dark Pro (B die). Cooling is a custom loop with the GPU and CPU, 2x360 mm radiators. Highest temp spike has been 74C. Anybody else getting higher clocks using FSB? Holy Smokes! Have you done a Conebench run? If everything is running correctly at that speed, you should be VERY close to 2000 points. I'll give it a run. I set back to stock speed because Kingdom Come: Deliverance was crashing to desktop, but now I'm pretty sure that was the GOG Galaxy client acting up, not any hardware issues. Interesting. 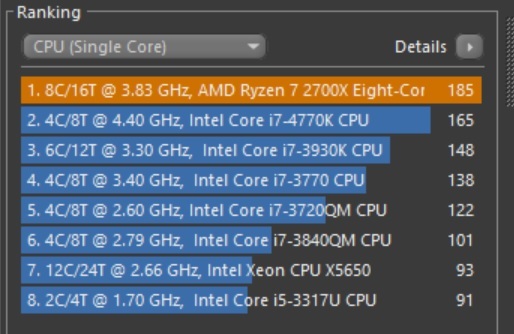 But is it all core boost and how long will it sustain @ 4490Mhz? This is using Precision Boost and increasing FSB so that each step in PB is higher. 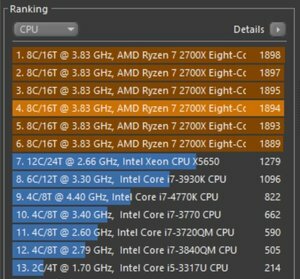 During Cinebench runs, the cores would run between 4180 and 4220 MHz. Increasing Precision Boost Overdrive from the default 2X to 4X helped, but nothing higher than 4X seemed to make a difference. Nobu and Pieter3dnow like this. 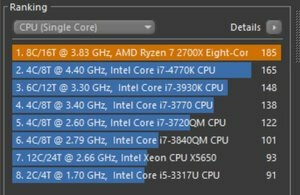 1898 points is exactly within the range of what you should get at 4.2 ghz. This is why I ask people to run CB when they have abnormally high clockspeed claims. Still, 1900 points is a VERY respectable score. One only achievable on Zen+.